The qualifications below came into force at the end of 2011 and replace the previous Unit based assessor awards, Unit A1 (known as NVQ Assessor Award), Unit A2 and Unit L20. All the previous assessor qualifications listed above including their predecessors Units D32 and D33 are still recognised and their is no requirement for any assessor holding or using one of these earlier awards to update to the latest standard providing that, the assessor is up-to-date with best practice and is currently using those older qualifications. In principle if you have not used your old assessor qualification for at least 18 month you MAY NOT be considered current and if you have not used your qualification for at least 3 years, in our view you would DEFINITELY NOT be considered current and would need to update. However, this decision on whether you are current or not will be made by the Internal Quality Assurer (formerly known as the Internal Verifier). The new QCF assessment qualifications work differently from the previous awards and the fundamental difference is that knowledge and understanding has been separated out into a stand alone Knowledge Unit. There are 3 Units in total, Knowledge Unit 301 plus 2 Performance Units, Unit 302 and Unit 303, which are used in combination to create 4 qualifications as below. Click the qualification’s title for further information. 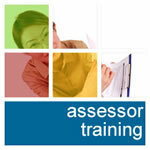 Which Assessor Qualification do I need?